Love exploring our trails? Do you have a child who attended Summer Nature Camp? Thank our interns! 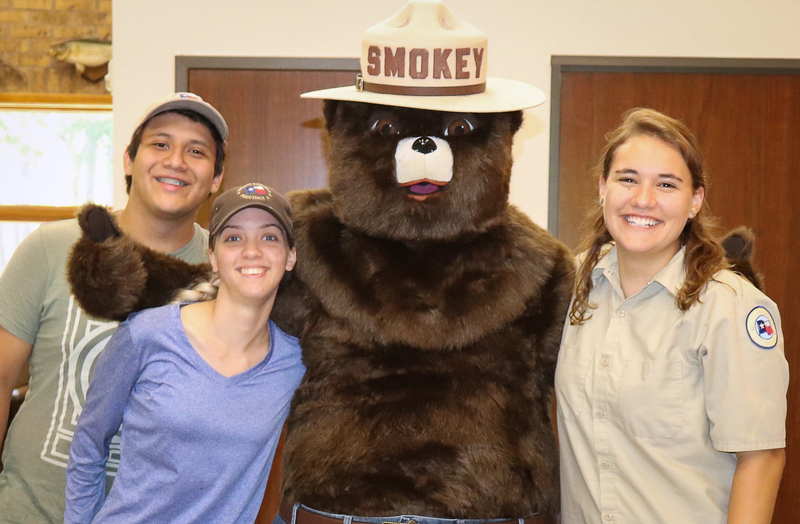 Every year, Jones Park welcomes new interns to help with Summer Nature Camp, trail projects, and other duties. We’re grateful for all the work our interns accomplish and the unique skills they bring to the park. Marilyn Alvarado, who interned her second summer this year, has dreamed of becoming a Texas Ranger since the seventh grade. Over the past two summers, we’ve watched her learn and develop new skills that will benefit her on her career path! This year, she was a tremendous help with Summer Nature Camp. She prepared crafts, supervised children, facilitated activities, managed camper check-in, and ensured every child had a great time at camp. Marilyn returns to Sam Houston State University this fall, where she is a senior studying Criminal Justice. Lexi Cook, also a returning intern, will begin her senior year at Quest Early College High School in the fall. Her goals include earning a bachelor’s degree in forestry and becoming a game warden. She especially enjoys working alongside staff and volunteers at Jones Park who share her career interests. This summer, Lexi ensured the park remained in top condition for visitors by attending to outdoor details like trail maintenance, litter collection, and mulching. Before becoming an intern, Enrique Castaneda volunteered at Jones Park as a senior with the Quest Homestead Team during the 2017-18 school year. Enrique has been instrumental in helping rebuild the Redbud Hill Homestead and is grateful for the opportunity to gain hands-on construction experience. Enrique is continuing his education at Lone Star College and plans to complete the Criminal Justice associate degree program in the Fall of 2019. Jones Park staff and volunteers appreciate all that the interns have contributed to the park and wish them much success as they move forward with their careers!